Mort Neff host of Michigan Outdoor Television. Neff was born in Pontiac in 1903. He was one of the first ever to bring the outdoors to television in 1951. His show ran for 24 years was informative as well as entertaining and served to inspire many Michigan hunters and anglers. It was reported that his outdoor reports caused certain areas of the state to be flooded by hunters or anglers when there was a good bite or good hunting conditions. 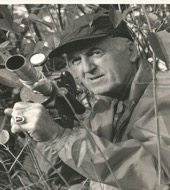 His show inspired a long run of other Michigan Outdoor television shows as well following in the same tradition of reporting on Michigan’s great outdoors.